Drifter Bits Hyderabad requirements of our clients we are involved in offering an extensive range of Drifter Bits. These Drifter Bits Hyderabad have robust construction and are well known for their superior finishing. Our products are manufactured in Drifter Bits Hyderabad using high quality raw material in compliance with international quality standards. Additionally, these are used in mechanical and construction industries and can be availed at industry leading prices. 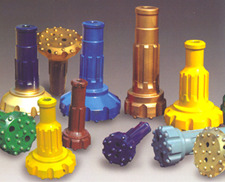 Trusted manufacturers, exporters and suppliers of large assortment of Drifter Bits in Hyderabad, Visakhapatnam. These are used in various industries and companies throughout the world. We provide products to our prestigious patrons as per the international industry standards. These are appreciated amongst the customers for their superior quality and durability. We are amongst the leading organizations, engaged in manufacturing, exporting and supplying a comprehensive and qualitative range of Drifter Bits Hyderabad. To accomplish the actual requirements of clients, we hold expertise in providing customization solutions. This further enables us in acquiring large support of the clients, which are based across the world. We are the manufacturers, suppliers and exporters of Drifter Bits Hyderabad. Our Drifter Bits are normally available in two types flat face and drop center. The thread forms of our Drifter Bits varies from R22 to R38, T41 and T51 and the diameter 1 3/4 inch to 3 inch.